Lawn Care Plus recognizes that lawn and garden care are vital components in maintaining the value and appearance of your property. Lawn Care Plus offers strata councils and their managers peace of mind that the job will be done correctly. 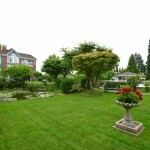 Lawn Care Plus is the company for all your landscape maintenance needs. No commercial or strata job is too large for Lawn Care Plus. 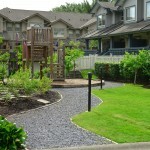 We specialize in landscape maintenance of townhomes, condominiums, home owner associations and retirement villages. Many strata corporations, property mangers and businesses rely on us to care for their grounds and to maintain an inviting appearance. 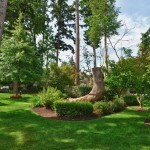 Our goal is to compliment the natural and structural beauty of your property through thoughtful maintenance, planing, timely execution, and meticulous lawn, flowerbed and tree care. We are so confident our customers will be fully satisfied with the work we do that we offer a thirty day cancellation policy as our guarantee. Our crew will always show up on time on their scheduled maintenance day, and we will be clearly visible in our bright orange uniforms. 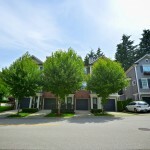 We will meet the Strata Council and Property Manager for a landscape tour at the start of the season to ensure our visions match and improvements are recommended in a timely fashion. We have a passion for landscaping and optimal plant health. We would never recommend an installation or service if we didn't feel it was necessary or had a high chance of survivability. We also strive to find the best prices for plants for our customers. You will never be surprised by additional costs - we don't charge by the hour. All additional work above and beyond the contract is submitted in writing for approval. Do you have any more questions? Customer service is our number one priority - so please come and talk to your site foreman and they will be happy to help you out. We are also prompt at answering our phone and email. 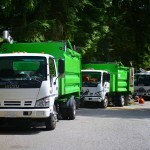 Our fleet of dump trucks is large enough to service any sized property. We love to take pride in the work we do. Customer satisfaction is our number one priority. Are you happy with the way your backyard or common grounds look? The staff from Lawn Care Plus have proven to be highly professional in attending to their contracted duties with respect to the numerous Strata Corporations which they service. Dan Spieanu, Property Manager Strataco Management Ltd. Lawn Care Plus has done an excellent job in all areas of the landscaping and has made the gardens into a beautiful showpiece that draws compliments from the many visitors that come to look at them. Lawn Care Plus' services have been prompt and competitive. It is a pleasure having worked with Lawn Care plus and I would recommend their services. The strata council has been more than pleased with the service delivered by Lawn Care Plus and we are delighted to renew the contract for the coming year. We give Lawn Care Plus our highest recommendation. Copyright 2018 Lawn Care Plus Inc.